Sheer Korma is a special and delicious dish, traditionally served on the two Muslim Eids, Eid Al-Fitr and Eid Al-Adha. This simple dish is an advanced version of Vermicelli noodles (Seviyan). 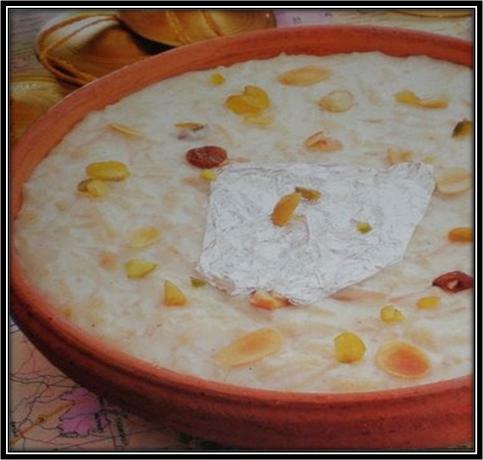 Sheer Khurma is prepared with some very easily available ingredients and is equally famous among children and adults. Place the butter on a non-sticking frying pan and set it on your stove over a medium heat. Let the butter melt completely and add in Vermicelli fry until lightly brown. Continue frying until the butter absorbs into the vermicelli. Now, add in ¼ cup of sugar and mix well for few minutes. Pour in whole milk and continue stirring until the sugar dissolves completely. Stir in whole cardamom, raisins, and almonds. Add the remaining sugar, cashews and pistachios into the vermicelli-mixture. Now, reduce the heat of the stove and let the sheer korma boil for few more seconds, until thicken well and the milk is halved. Speedily pour in the rose water, charoli and fresh cream. Now, cover the pan properly and let it simmer for 8 to 10 minutes. Remove Sheer Korma from heat, pour into a large serving bowl and garnish with crushed cardamom and saffron strands. Set aside until chill well to eat and serve immediately.